they eat insects — so don’t check your bird feeders for them. To see warblers you should bring along binoculars. You also need to go where the food is and be there when they are feeding. And, as their name indicates, in spring be prepared to hear some great songs. Warblers, like some other songbirds, migrate at night. It may be to avoid predators, or to have a less turbulent flight, because they use the stars to navigate, or any combination of the above. They also tend to migrate in flocks and sometimes the flocks can be very large. When you start to see daylight, warblers will start landing and immediately feeding. Depending on how long they have flown, they can be ravenous and might ignore you as they flutter around the underside of leaves and fly out from branches to catch tiny insects. Check also towards dusk as they are then trying to pack in as much energy as possible before flight time. The best places to look are where the bugs are! Trees are important as many warblers glean the insects off the tops or underside of leaves. So, parks and urban areas are good places to see warblers as they have small isolated stands of trees which the birds see from above as they are looking for a place to land and feed. Warblers migrate in stages, with the brightly colored males arriving before the females. Their flight dates depend on the weather as the temperatures must be warm enough so there are the right insects and other food available to eat. 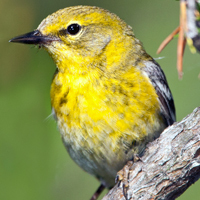 Pine Warblers are in the first wave of warblers to come through the mid-Atlantic states — starting before April. They have one of the shortest migrations of all warblers — from Florida to southern Canada. 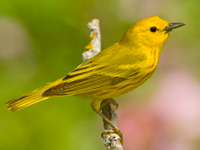 To see Pine warblers, look in pine trees and listen for their song! the bright yellow males in scrubby leafy forested habitat, including orchards. These birds can be found across the US in summer. The distinctive Canada warbler with his gorgeous black necklace on a yellow throat is one of the last warblers to arrive – and one of the first to leave to go back to South America. Canada warblers have a long migration from South America to the NE US and Canada. Look for Canada warblers in scrubby wooded areas that are moist. 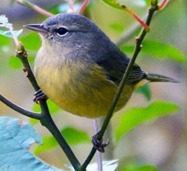 If you are new to birding, the first warblers you see may be a revelation. For many people who watch birds, warblers are the highlight of the migration season and they never disappoint. Although warblers are small, they are not always difficult to see as they are active feeders, brightly colored, and in the spring are very vocal. Some have truly beautiful songs. A good way to start seeing warblers is to listen, and look for small active birds in the trees in early morning and late in the day. If you are patient, you may be rewarded with some amazing sightings!